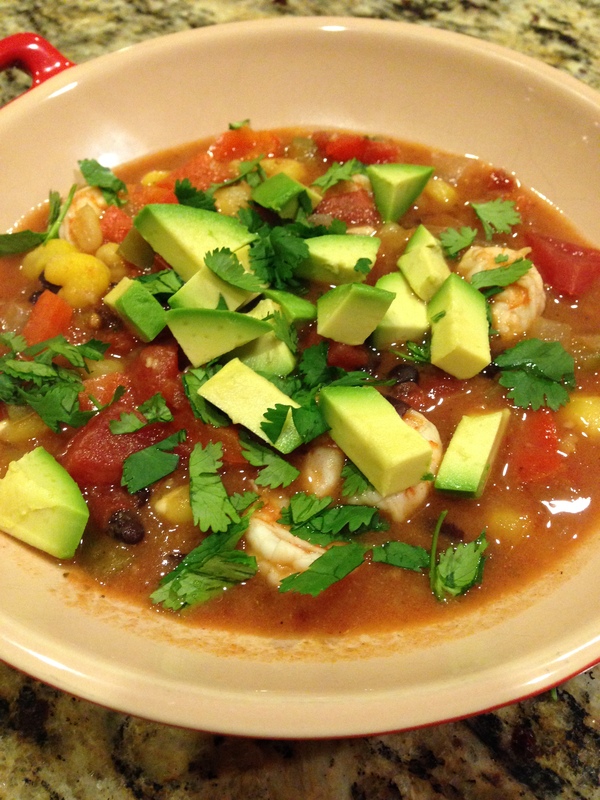 There seem to be several ways to spell this traditional Mexican stew, and even more ways to cook it. My Mom makes it often but without any specific recipe, and I don’t cook it regularly enough to ever remember what I put in it the last time — so this post is for the specific purpose of being able to recreate my posole next Christmas without searching the internet. Posole is traditionally made with a base of onion, peppers (poblano, chipotle, and bell peppers), garlic, tomatillos, tomatoes, and hominy. The hominy is what makes it special, in my opinion. I like to add shrimp at the end, but chicken or beef would work too. Make a huge batch, bake some cornbread, and you are ready to feed a crowd. Heat the oil over medium in a large dutch oven. Add the onion, peppers, and tomatillos and cook 5-10 minutes, until softened. Add the garlic, seasonings, and chipotles in adobo sauce and cook another minute, then add canned tomatoes, broth, and hominy. Bring to a boil and then cover and reduce to a simmer, allowing to cook for at least 20 minutes, but up to a couple of hours if you have the time. Add the black beans and cook another 5 minutes. Right before serving, add the shrimp, cooking just 1-2 minutes until the shrimp turn pink. Garnish with avocado and cilantro (sour cream is good too). I’ve been on the Greek yogurt bandwagon for a while (Fage is my absolute favorite) and recently went from buying the kind with the sweetened fruit to getting the plain versions and mixing in my own cereal, fruit, etc.. I’m always hearing that Greek yogurt is the perfect substitute for sour cream and can be used in many savory ways, but I had yet to find a good use until seeing C&J Nutrition’s recipe for Cucumber Salad in Self Magazine. 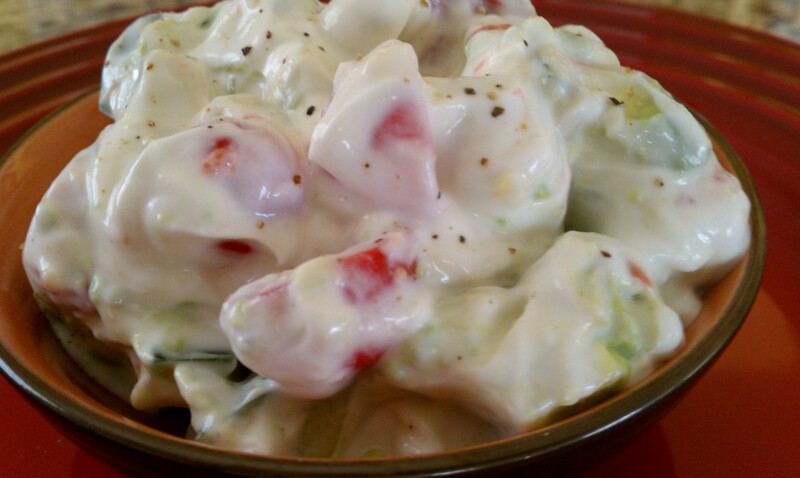 To 1/2 cup of plain Greek yogurt, add 1/2 cup diced cucumber, 1/2 cup diced tomatoes, 1/4 chopped avocado, and salt & pepper. That’s it. It tastes amazing and is a nice change from my normal sugary yogurt snack. Best. Salad. Ever. This Sushi Salad from Clean Eating Magazine is essentially a deconstructed crab and avocado roll with all the authentic sushi flavors — right down to the wasabi-soy dressing. Both my husband and I loved it. I did make one fairly significant change (we’ll call it an upgrade) — cutting the rice in half and doubling the lump crab. If you like sushi rolls, you must try making this salad (oh, and it’s quick and easy to put together). In a small bowl, whisk together the wasabi, soy sauce, vinegar, and honey. Set aside. 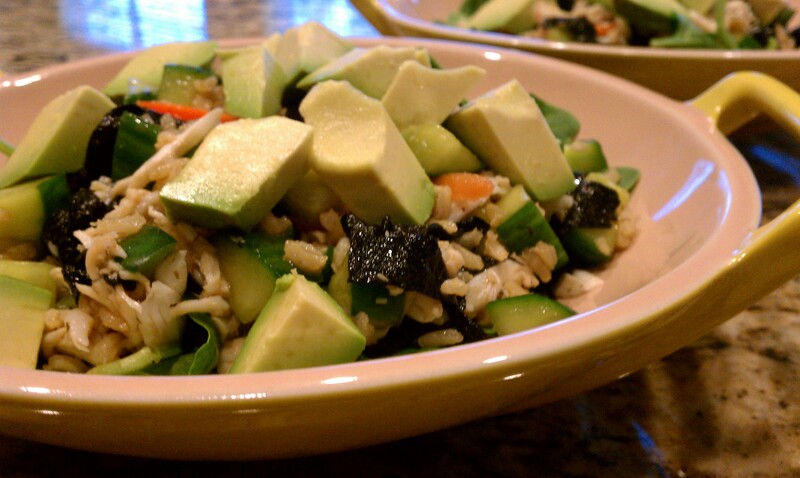 In a large bowl, combine the rice, cucumber, nori, and carrot. Drizzle in dressing and stir to combine. Gently fold in crab. Divide spinach into 4 bowls and top with crab mixture and avocado. Serves 4. The first thing I ever learned to cook was spaghetti with meat sauce — in home ec class, no less. I can remember asking my Mom if I could use my newfound skills to cook dinner for her and my Dad, and I put a little shake of everything I could find in the spice cabinet into that sauce. The bad news: my Mom has always had a very well-stocked spice cabinet. She looked up from her plate and asked, “is this dill I taste?”. That was my first lesson on how not to make spaghetti sauce. But as a teenager there were a lot of spaghetti nights with friends, and in those settings we tended to revert back to just throwing in whatever we could find, and it was always a ton of fun. My girls love spaghetti too, but they are not big on tomato sauce. I need to keep working on that one. 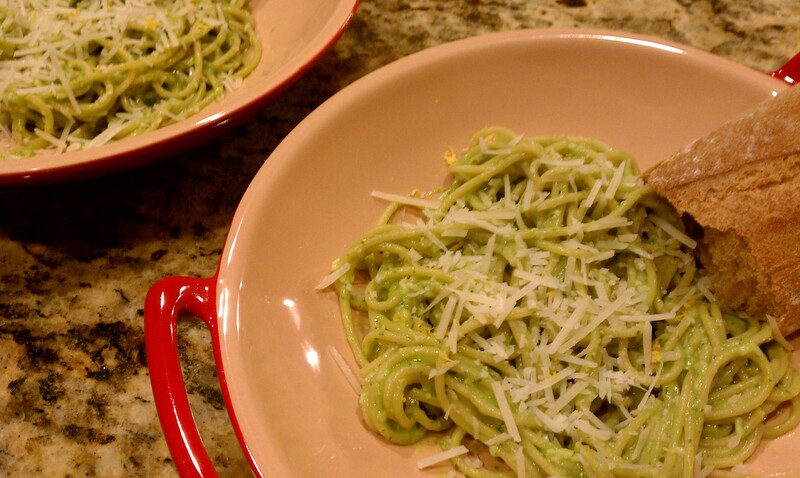 In the meantime, I thought I would try Angela Liddon’s quick creamy avocado pasta with basil, lemon, garlic, and olive oil. I stayed true to the recipe at the beginning, although I opted for just one clove of garlic (I wanted the kids to like this). Once everything was blended in the mini-chopper, it seemed thick and very lemony, so I added some extra olive oil, a few tablespoons of water, and a good handful of shredded parmesan. And suddenly, it tasted just like summer with all that fresh basil and olive oil. After mixing the sauce with the spaghetti I added about 1/3 cup of the starchy pasta water and topped it off with more parmesan. There was a lot of sauce — the recipe says it is for 2 servings of pasta; I made 3 servings of pasta and there was still sauce leftover. The verdict? Amazing! And so easy to make. Lauren was clearly thrown off by the green color, but she was fine after a few bites. Samantha loved this dish. But she also commented, “I wish it was bucatini instead of spaghetti!”. That’s my girl.